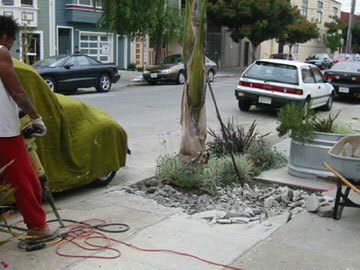 Paving-to-planting conversions are taking place throughout San Francisco. To participate, use the "How-To" Section of this website or contact Plant*SF with your ideas for partnering on larger projects. 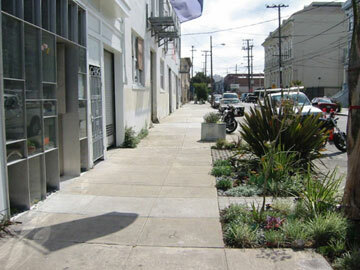 By partnering with the building's five tenants (Southern Exposure Gallery, and restaurants Central Kitchen, Salumeria, Trick Dog and Humphry Slocombe Parlour), this project received grant funding from the San Francisco Community Challenge Grant and SFPUC Urban Watershed Grant to divert 100% of rain water runoff from 5,130 sf (342 linear feet) of formerly paved sidewalk into plantings and permeable pavers. Over two days, sixty volunteers planted and mulched over 600 native and climate adapted plants. A plant list is HERE. No irrigation was installed. Plants will be hand-watered to establish and thereafter will thrive on rain water. Native plants sourced from Nature's Acres Nursery. Design and implementation by Shift Design Studio. Concrete and paver work by Park View Construction. Special thanks to David White at NeTimeas for his vision and dedication to the project. At the request of Community Housing Partnership, a non-profit providing supportive housing for the formerly homeless, sidewalk landscaping was created at the Arnett Watson Apartments, an 83-unit building home to 36 individuals and 47 families. 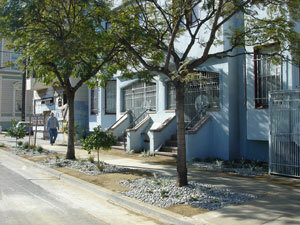 The landscaping serves CHP's goal of greening their properties and operations. 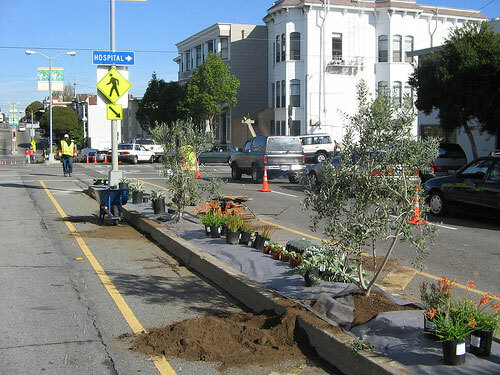 It was planted as a Plant*SF-led workshop offering an opportunity for residents to beautify their home while learning about climate-adapted plants. 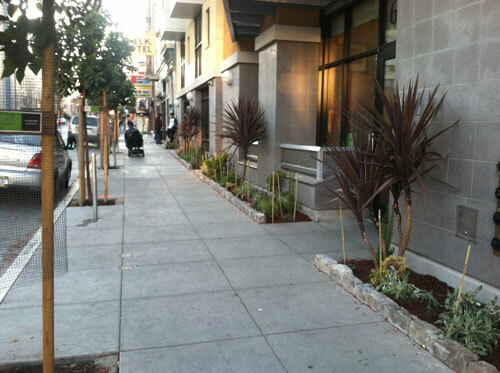 A first of its kind in the densly populated Tenderloin District, it includes such species as Cordyline, Dodonea, Arctotis, Eurphorbia as well as several varieties of fragrant Pelargonium. This project was made possible through funding from San Francisco Beautiful. Thanks to Matarozzi/Pelsinger Builders for additional financial support. 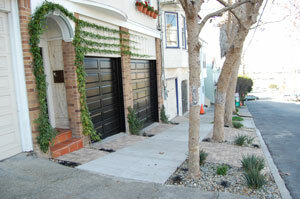 Plant*SF is pleased to announce the completion of sidewalk-to-garden conversions at five properties in Noe Valley. 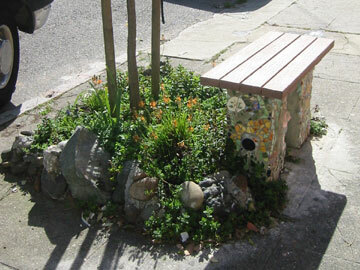 This project received funding support from the SFPUC Urban Watershed Grant via the 2011 San Francisco Community Challenge Grant and in partnership with the property owners who maintain the garden. The gardens were designed to reduce stormwater loads on the combined sewer system by diverting rain into the ground to nourish plants, enhancing the sidewalk. Low-maintenance plants were selected to thrive in this microclimate and do not require irrigation. Features include reclaimed vintage granite cobbles from San Francisco streets used as edgers and Calstone permeable pavers at walkways (both available at Broadmoor Landscape Supply). Short lengths of bamboo poles are used to deter trampling. 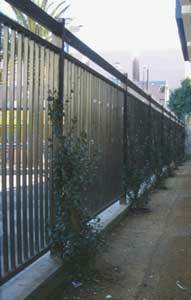 This is an effective, low-maintenance and low-cost alternative to fencing. A plant list is available HERE. 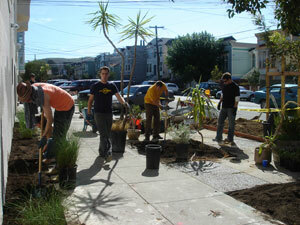 Plant*SF is pleased to announce the second location of the Sunset District Sidewalk Landscaping Demonstration Garden. 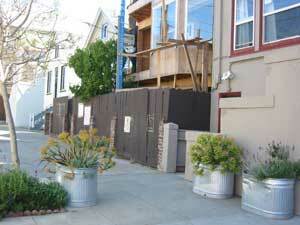 It is located at four properties on the east side of 5th Avenue between Irving and Parnassus Streets. This location was selected because of adjacent neighboring properties offering a large square footage potential area; an entirely paved ‘before’ condition; highly visible location including being on a major transit line; favorable solar exposure (west facing); and agreeable property owners. A refined palette of colorful, hardy native and climate adapted perennials were used. You are encouraged to download the PLANT LIST as a reference. Permeable pavers replace concrete at the driveways and walkways. The paver model is "4x8 Permeable" by Calstone set in a herringbone pattern over a gravel base for increased stability. Designed and facilitated by Shift Design Studio. Thanks to: Sunset Concrete, Broadmoor Landscape Supply, Calstone Company (concrete pavers), Pacific Nurseries, and the property owners. This project was made possible by the San Francisco Community Challenge Grant, the San Francisco Public Utilities Commission and the San Francisco Parks Trust. Plant*SF welcomes your continued interest and hopes you will use this demonstration garden as a resource to help accomplish your greening goals; you are invited to volunteer to help with the project or just stop by as it grows in over the years. 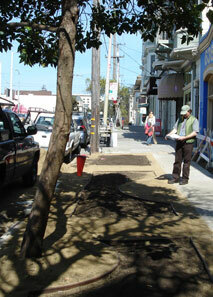 Plant*SF is pleased to announce the first location of the Sunset District Sidewalk Landscaping Demonstration Garden. It is located on the northwest corner of 46th Avenue and Wawona Street. While very many quite worthy project sites were proposed by residents and business owners (more than 145 applied), this location was selected because of its corner location offering a large square footage potential area; an entirely paved ‘before’ condition; highly visible location including being on a major transit line, near destinations such as the zoo, the ocean, and a garden center; favorable solar exposure (south and east facing); and an agreeable property owner. More than 30 species of plants (including 13 native species) are arranged in groups: grasses, native and climate adapted perennials, and succulents. You are encouraged to download the PLANT LIST as a reference. Please note some species are experimental in this location - to see how they hold up to wind, salt and fog. 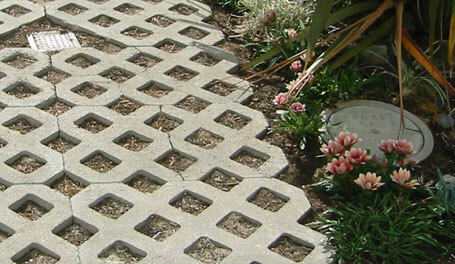 Permeable pavers replace concrete at the driveways and walkways. The paver model is "4x8 Permeable" by Calstone set in a herringbone pattern over a gravel base for increased stability. Designed and facilitated by Shift Design Studio. Thanks to: Sunset Concrete, Sloat Garden Center, Broadmoor Landscape Supply, Calstone Company (concrete pavers), Pacific Nurseries, the property owner and many dedicated volunteers. This project was made possible by the San Francisco Community Challenge Grant, the San Francisco Public Utilities Commission and the San Francisco Parks Trust. Vines provide significant greening with minimal footprint at this residential property. Permeable pavers provide visual continuity despite the large area of driveways. Pavers used are manufactured locally by Calstone and available through Broadmoor. The paver model is "4x8 Permeable" set in a herringbone pattern for increased stability. Design by Shift Design Studio. Photo courtesy N.Dvorak. 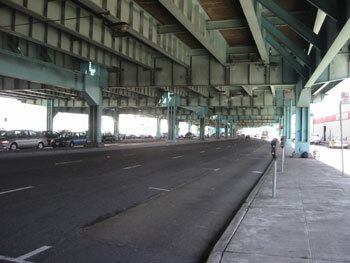 In the late 1970's, several sidewalk extensions were created along Harrison Street by the planning department in an attempt to humanize this extremely wide residential street. However, because they were fully paved and in addition to already-wide expanses of sidewalk, a bleak landscape remained. 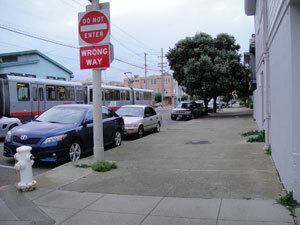 In October 2007, neighbors at Harrison and 23rd Streets partnered with DPW to remove a total of 1,000 sf of concrete and underlying roadway at two of these so-called "bulb-outs". 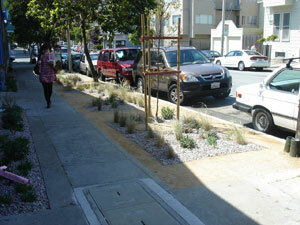 At the same time, 5 property owners added sidewalk landscaping to their frontages, for an additional 1,100 sf. In additional to environmental benefits, this project has resulted in a significant social transformation of the block - reinforcing the pedestrian scale, making a more hospitable and interesting walking experience, and inviting neighborly interactions. The plantings have brought together long time residents with more recent arrivals - as evidenced by neighbors introducing themselves after 30 years of living around the corner from each other and a 4-day-old introduced to nature on his first outing. Butterflies have already discovered the spot. Landscape design by Shift Design Studio. 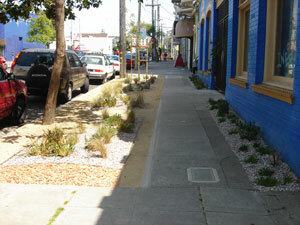 Download the information sheet for photos of the completed installation.Phase 2 of the Harrison Greenway was planted in January 2009 as "Mission Roots", a group of 23 property owners who received funding from the City of San Francisco's Community Challenge Grant. 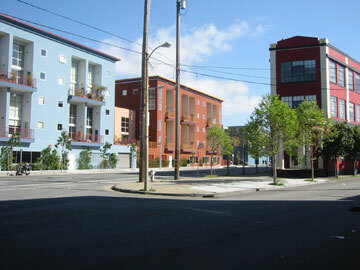 Phase 3 of the Harrison Greenway will be planted in 2010 as "Mission Verde", a group of 17 property owners who received funding from the City of San Francisco's Community Challenge Grant. Phase 4 is in the planning phase - please contact Plant*SF if you would like to participate. 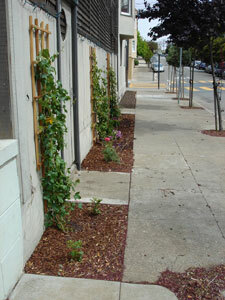 This neglected stretch of sidewalk surrounding a fenced parking lot is being transformed through sidewalk gardens. 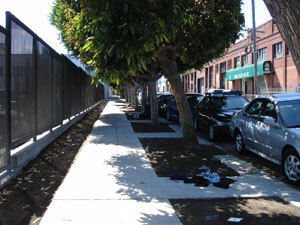 Formerly an unsafe and unsightly site of frequent illegal dumping and homeless encampments, this area extends the existing Shotwell Greenway and (with 3236 18th Street shown below) helps establish the 18th Street Greenway. Extending into the property to include an area for a heritage tree, the plantings also serve to divert stormwater from areas of the parking lot. All plants used are San Francisco natives which were propagated locally, are drought tolerant and require no irrigation once established. This project removes 3,300 square feet of concrete and is phase one of a street greening partnership with Pacific Gas and Electric (PG&E) which will eventually continue around the entire block and to other PG&E properties. 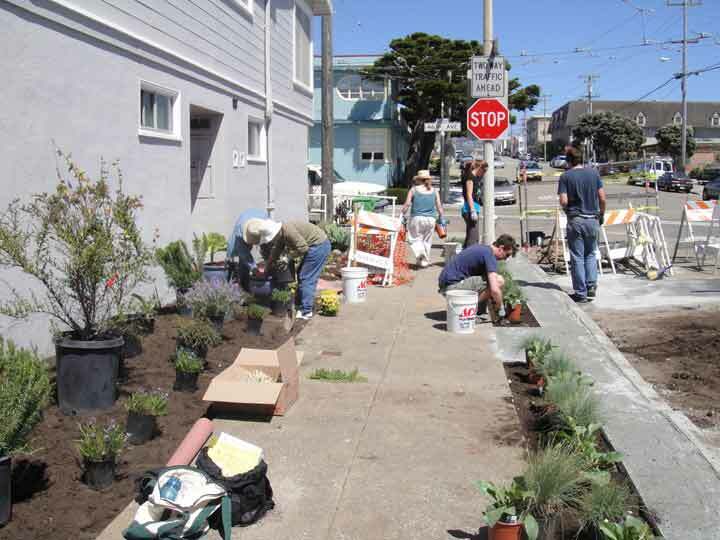 This partnership aims to help PG&E be better neighbors and make good on their "Let's Green This City" campaign while bringing the message of sustainable streetscapes to a wider audience. Landscape design by Shift Design Studio. Plants supplied by BayNatives. Occupying a corner location, the sidewalk landscaping at this urban victorian single family home doubles the area of its private back yard, while benefiting the neighborhood instead of being only for the owner's enjoyment. The semi-formal design expands basins at existing trees. At the owner's request, exotic species are featured alongside several native species and a lemon tree. 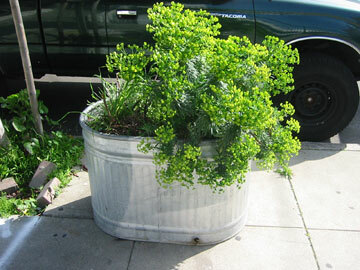 All plants are drought tolerant and require no irrigation. Landscape design by Shift Design Studio. 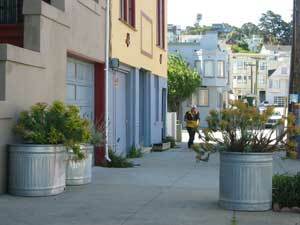 San Francisco native species are the highlight of this sidewalk garden. The owners' young children were involved in the planting and observe the garden's growth from the living room window as well as on their way out the door. 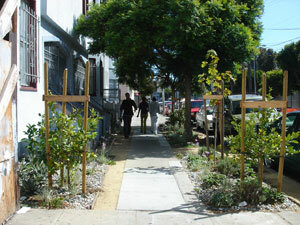 This is an example of a simple way to bring nature back to our everyday urban lives. All plants are drought tolerant and require no irrigation. Landscape design by Shift Design Studio. 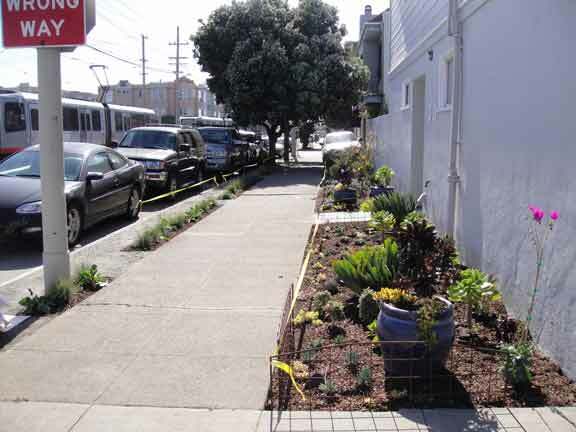 Located on the 125' long street frontage of a commercial plant nursery in the Bayview District, this sidewalk garden will double as a showcase of suitable sidewalk garden plants. 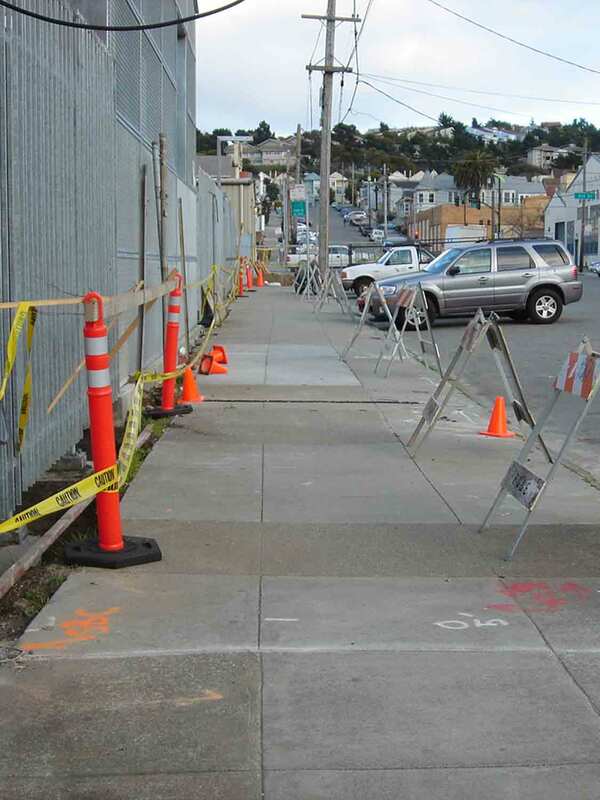 After following sustainable building standards in the rest of the project, the owner was disappointed to learn that city inspectors expected the sidewalk to be completely replaced. 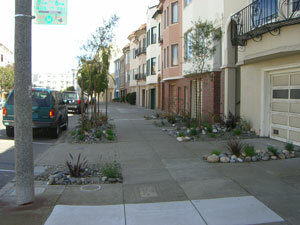 Seeking a more sustainable option than removing and replacing over 3,300 square feet of largely unblemished concrete (on both Jerrold and Innes Avenues), owners elected to apply for a sidewalk landscaping permit which reduced the area of replacement by 40%, saving considerably on material resources, energy and labor. Additionally, vibrant plantings will now appear in this otherwise lifeless expanse of concrete and asphalt, while providing an outward identity to the nursery and prime space for demonstration gardens. Special thanks to Flora Grubb, Seth Boor and Matarozzi/Pelsinger . 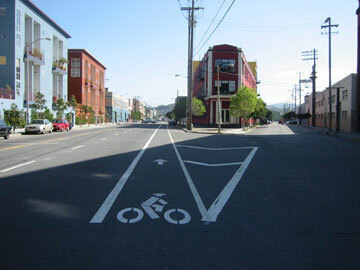 The Shotwell Greenway (featured near end below) turns the corner - both literally and figuratively. 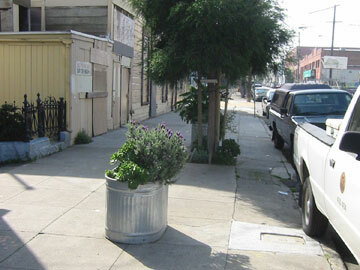 Located just around the corner from Shotwell Street on 18th Street in the Mission, this sidewalk garden expands upon the ideas tested in the initial model. This project was undertaken in response to a notice to repair the sidewalk due to cracked concrete and sidewalk heaving from maturing trees. Plant list includes natives such as Big Leaf Maple and North Coast Dudleya, edible Meyer Lemons, as well as a continuation of drought tolerant species used in the Shotwell Greenway (lavender, aloe, tulbaghia, etc.). Landscape design by Shift Design Studio. 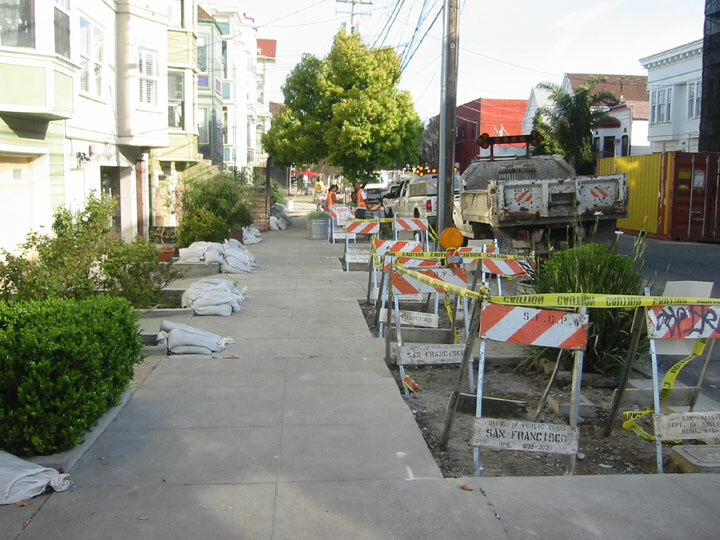 After receiving "30-day Notice to Repair Sidewalks", a group of neighbors on Shrader Street (between Haight and Waller Streets) elected to remove large areas of sidewalk instead of replacing it. This provides a better environment for the trees which were causing sidewalk buckling, meaning that the property owners save money from having to replace concrete in the future. 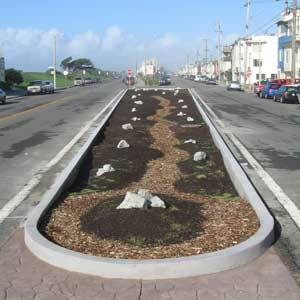 It is planted with native grasses and wildflowers propagated from local stock which require no irrigation. The tan material pictured is decomposed granite, a compacted, durable, walkable and permeable surface. The terra cotta material is a locally produced, post-consumer recycled product made of tumbled broken pots. Between three properties in the first phase of this greenway, there will be over 300 linear feet converted to sidewalk gardens. 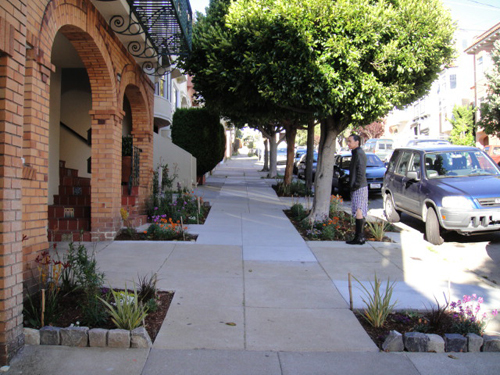 This configuration has plantings on both sides of the remaining sidewalk for a walk-through garden feel and to protect the buildings from easy tagging and chronic loitering. Landscape design by Shift Design Studio. 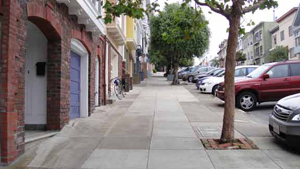 With twenty-foot-wide sidewalks and no vegetation, neighbors in adjacent properties on this Marina District street realized there was plenty of opportunity for a dramatic transformation and increased infiltration (water into the ground instead of the sewers). Several sizes of stone create large areas of texture to this otherwise monotonous and barren urban landscape. 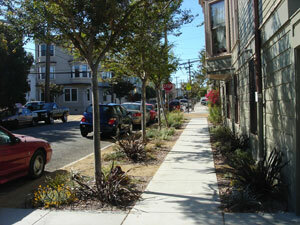 Several trees were added as well as drought tolerant plantings. 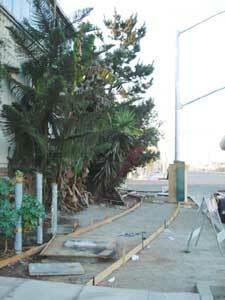 A second layer of sidewalk was uncovered below the current sidewalk, which was a surprise to the crew, but they proceeded undaunted and now benefit from a buffer from the street as well as greenery and shade. Landscape design by Saskia Lotfi. Photo credit: Alexa Fabrega (left), Saskia Lotfi (right). The first phase installation of this sidewalk garden introduces permeability and vertical greening with vines along the building's edge. 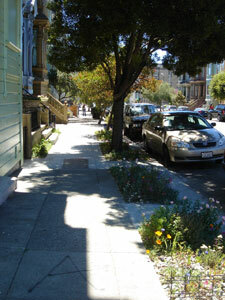 This creates a buffer between the house and sidewalk and gives pedestrians the feeling of walking through a garden. 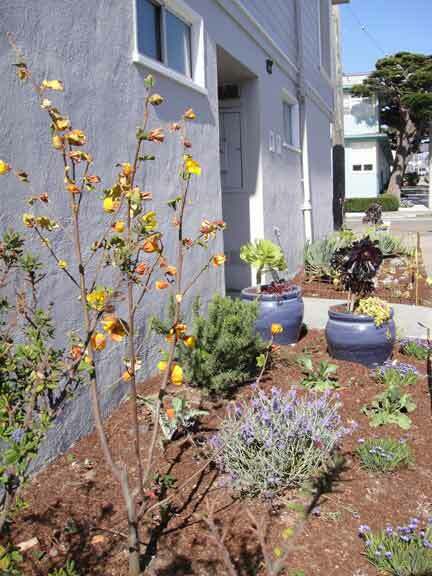 The full design features espalied fruit trees and other drought tolerant edibles for humans on the house side while edibles and habitat for birds and butterflies appear on the street side. No irrigation is required. Landscape design by Shift Design Studio. In conjunction with a new bridge over Islais Creek at Illinois Street south of Marin Street, Port improvements precipitated the near-complete demolition of a former community garden. 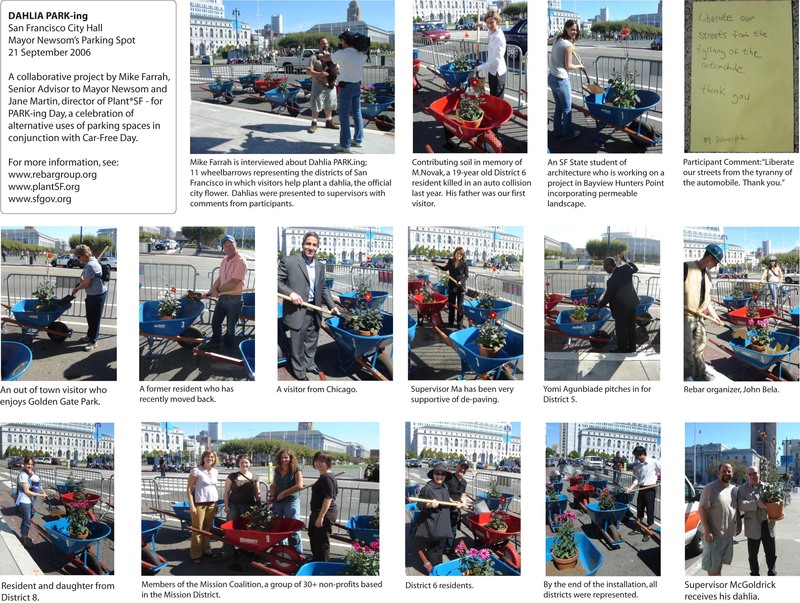 Working as a liaison between the Port and a community group, Plant*SF demonstrated areas to be retained for a garden and socializing, while accommodating the demands of infrastructure and code compliance. 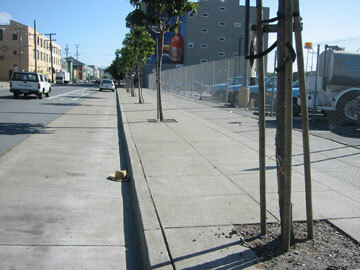 The site is along the BlueGreenway area of the San Francisco Bay Trail. 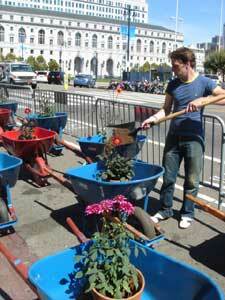 In 2006, this temporary interactive installation in Mayor Newsom's parking spot outside City Hall in San Francisco called attention to the need for urban street greening and engaged citizens and supervisors with dahlias, the official city flower. A collaboration with Mike Farrah, Senior Advisor to Mayor Newsom. In conjunction with PARK-ing Day sponsored by Rebar and the Trust for Public Land. After initial seeding. Photo Dave Ferguson 2006. Working with Supervisor Fiona Ma, a group of neighbors have reclaimed a significant amount of ground from a vastly paved area at the convergence of two major streets in this community adjacent to the Pacific Ocean. 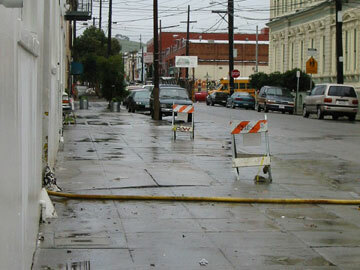 In November 2005, the San Francisco Department of Public Works provided concrete removal as well as the pouring of a new curb to prevent autos from entering the landscaping. Special thanks to (then Supervisor) Fiona Ma, Dave Ferguson, and Mohammed Nuru, DPW. 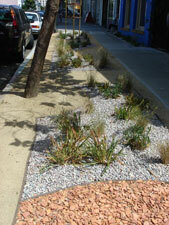 The San Jose Guerrero Save Our Streets (SJG-SOS) Neighborhood Group conducted this inspiring project in November 2005, creating an oasis of drought tolerant plants and trees in place of a concrete median. Species include palms, olive trees, euphorbia, kangaroo paw and agave. 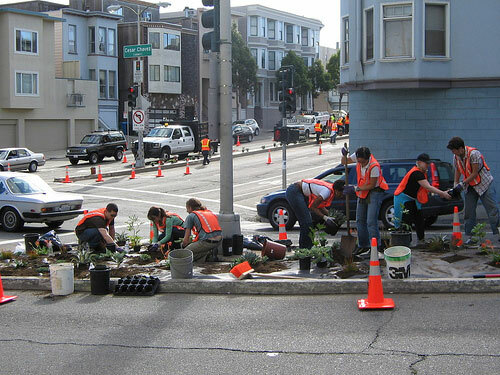 The San Francisco Department of Public Works provided concrete removal and plant installation labor alongside neighborhood volunteers. 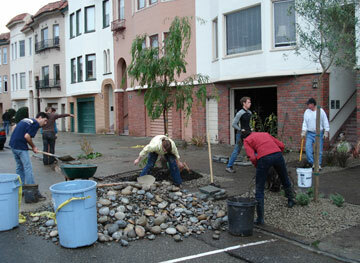 This project was sponsored by the Mayor's Office of City Greening. Special thanks to Gillian Gillette, Flora Grubb, Marshall Foster, Mohammed Nuru and Ed Lee. Photos courtesy of Gillian Gillette. See www.sanjoseguerrero.com. Vines soon after planting, 2006. 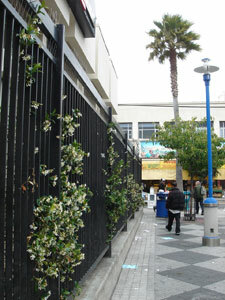 With renovations completed at the southwest corner of the 16th and Mission BART station, Plant*SF encouraged the neighboring Wells Fargo Bank to de-pave a narrow passage along the fenceline and plant a climbing fragrant vine for the environmental and social benefits of greenery in this public space. The opportunity to depave was welcomed as a means to avoid undertaking an alternative scheme that would have required mechanical drainage. Instead, permeable decomposed granite permits water to infiltrate the ground. The bank building features large glass windows facing the BART plaza which were always hidden behind closed blinds. Now, the windows are exposed, providing natural light and a pleasant view of the vines to employees and patrons. In addition, the bank has also extended its outdoor ATM hours. 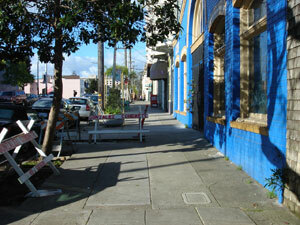 These are modest but meaningful signs of reclaiming the public space from crime and hazards. Special thanks to Wells Fargo Bank and Branch Manager, Rose Posada. 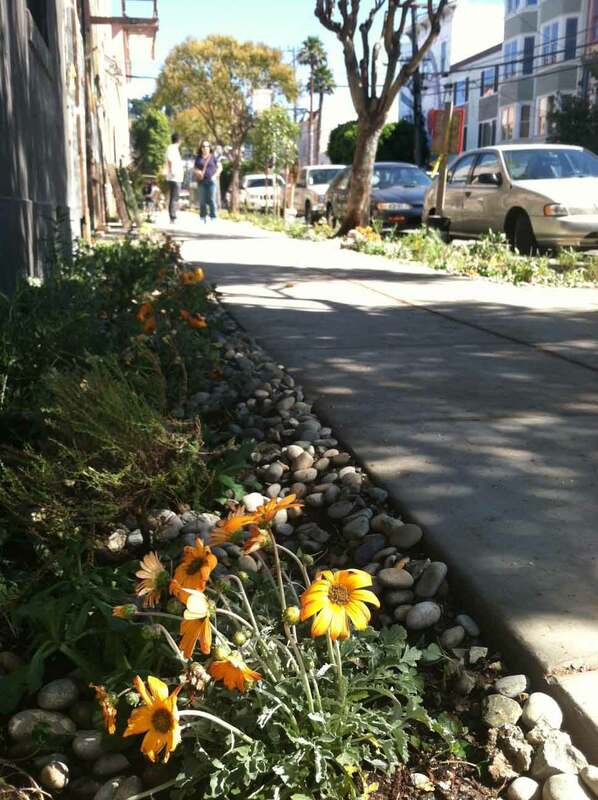 This model sidewalk garden is a joint project of the Mayor's Office of Neighborhood Services, Departments of Public Works and Public Utilities Commission and Shotwell Street property owners. 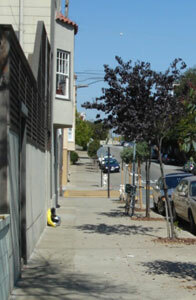 It is the premier project of Plant*San Francisco. Installed in March 2005 by removing significant portions of formerly existing concrete sidewalks, it demonstrates one approach to reducing storm loads on the combined city sewer system. 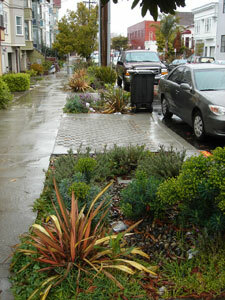 Instead of entering the sewer, rain water is now permitted to permeate the exposed soil and nourish plants. 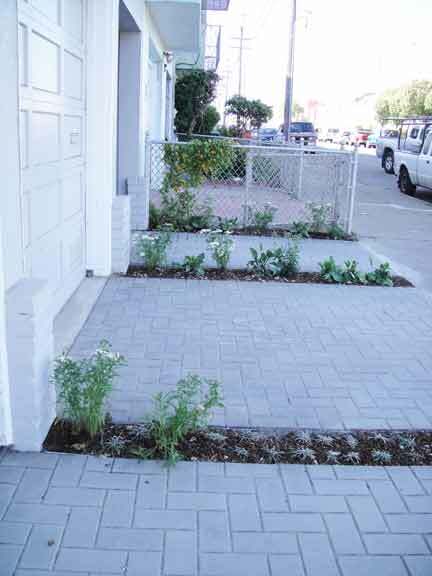 When this method is implemented throughout the city, it will result in a significant reduction on the currently overloaded sewer system.The drought tolerant plants were selected by the neighborhood association in collaboration with the Department of Public Works who installed them. Plantings were undertaken during the wet season and no irrigation is provided or required. 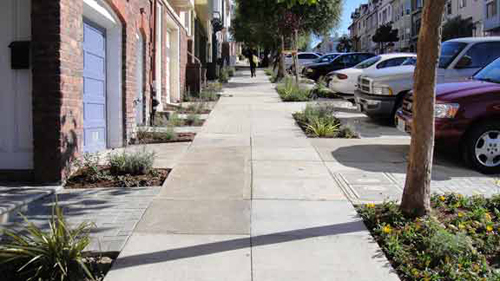 CITYWIDE GREENING ADVOCACY Plant*SF advocates for permeable landscape and use of drought-tolerant and native plantings - and makes educational presentations to city agencies, architecture and design firms, neighborhood associations and other groups. Most notably, these have included the San Francisco Mayor's Office, San Francisco Public Utilities Commission, SPUR and SafeCleanGreen. Our informational booth at World Environment Day 2005 in San Francisco generated interest in visitors from local Bay Area communities as well as those from as far away as Japan and Kenya. 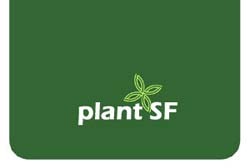 Please contact Plant*SF if you would like a presentation in your area. 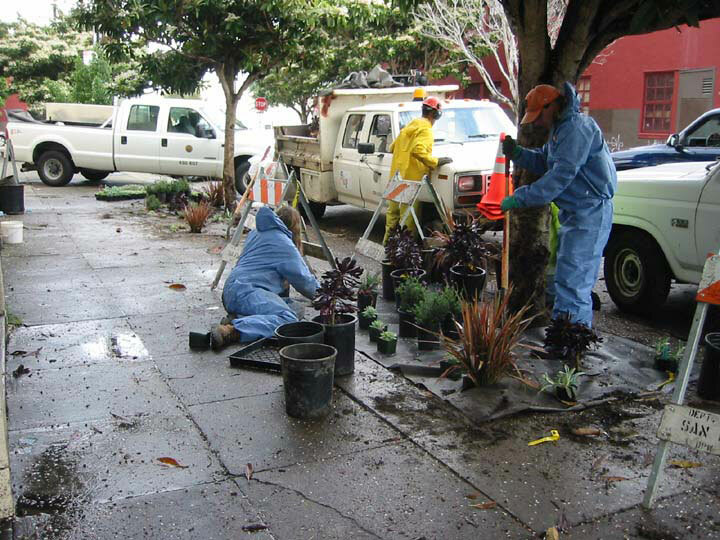 Plant*SF continues to work with the DPW Bureau of Urban Forestry and Bureau of Street Use and Mapping inspectors to increase awareness of the new policy and to clarify standards as they are applied to various configurations. 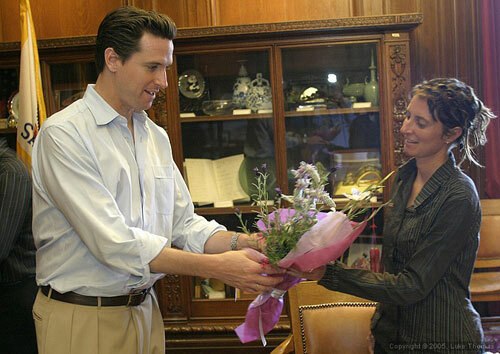 Mayor Newsom's 2005-2006 City Budget included $14.0 million "to improve and beautify our neighborhood and commercial corridors", in addition to $20.9 million "to repair our parks and complete stalled playground and recreation center construction projects". 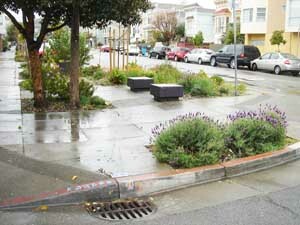 Plant*SF advocated that these funds take advantage of an opportunity to implement stormwater diversion as well as the use of drought-tolerant and native plantings. 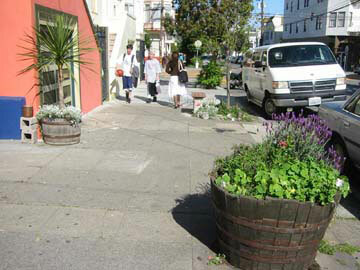 An example of allowable private gardens in the public right-of-way, this sidewalk garden was installed in 2003 in the Mission District of San Francisco. 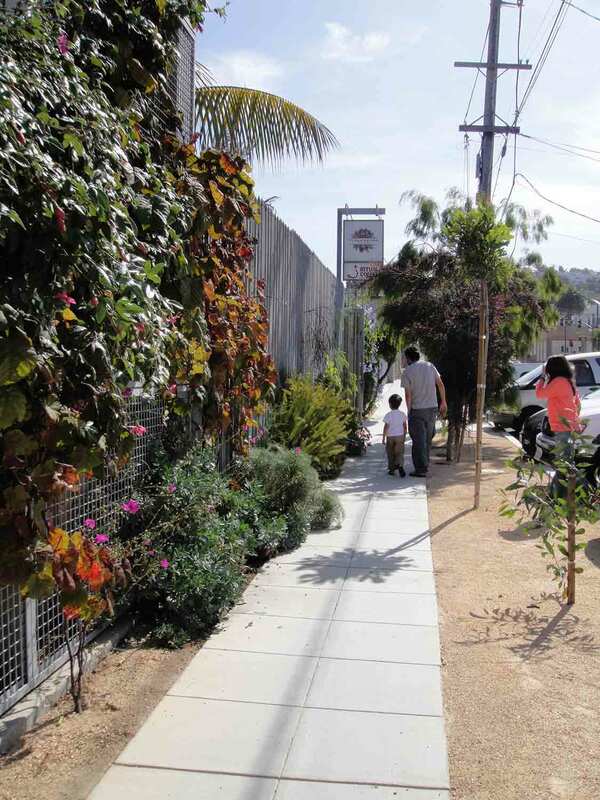 In an area known for parking and driving on the sidewalks, a permit was granted to replace forty percent of the concrete in this 14' wide sidewalk with plants and permeable paving. 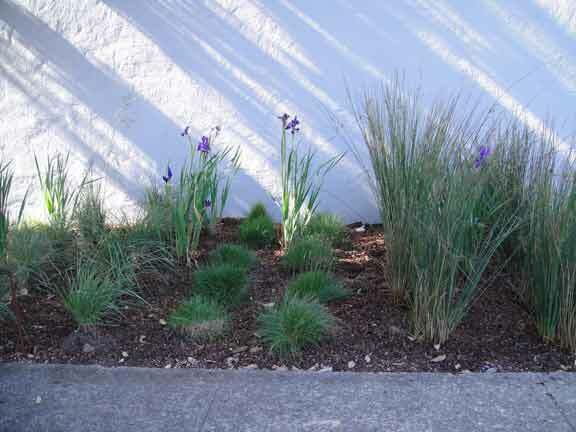 Using drought tolerant and native species, it is not irrigated and does not require regular watering. 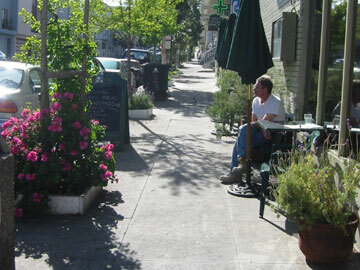 An emphasis is placed on texture and height variation as well as a soft color palette, resulting in a pedestrian (and butterfly) friendly streetscape. 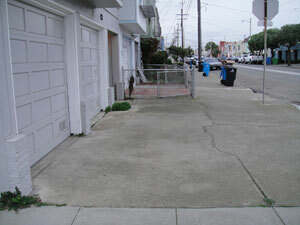 Auto access is maintained by a concrete paver strip and a plantable permeable driveway. Sample of city-approved permeable paving for driveways. 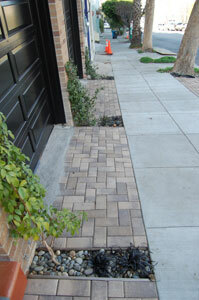 Note that utilities (gas, electric and water) coexist with pavers and plantings. Note that other permeable pavers are now allowed - contact DPW's Bureau of Street Use and Mapping for the current list. Pavers are laid over gravel and sand bed. Areas of dirt may be planted with varieties of dense low plants which may be driven over. See the "How To" section and Resources (Permeable Pavers) for details. While permeable landscaping may take place simultaneously citywide in all neighborhoods, for the purpose of minimizing loads on the city sewer system priority should be given to locations at higher elevations so that water may be absorbed before heading downstream with force. 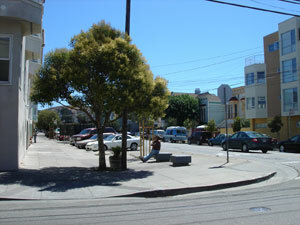 The 'nomansland' of Division (13th) Street separates SoMa from the Mission District. This expansive site provides ample opportunities for permeable landscaping in medians and sidewalk locations. 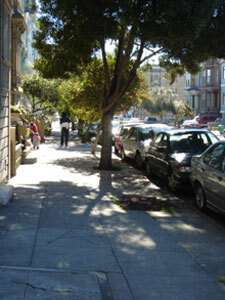 Shade gardens and climbers may be appropriate. Restructuring the use of these areas would result in stitching these now disparate neighborhoods together. It has been suggested that Division Street could be renamed "Vision" Street. 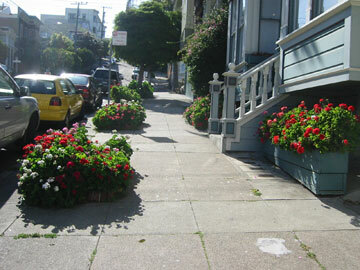 Many sidewalks in San Francisco are wide enough to accommodate plantings. 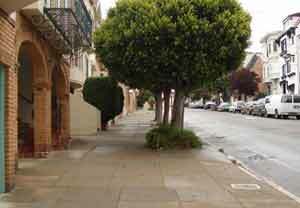 Sidewalk plantings provide a psychological and physical barrier between vehicles and pedestrians. 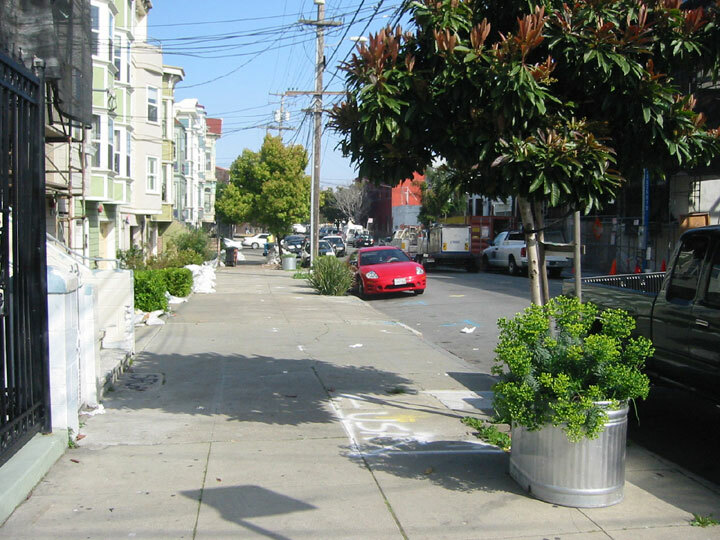 While plants thrive in little ground area, it is important to expose as much earth as possible to maximize water diversion.The impulse to add plants to the public right-of-way is in evidence throughout San Francisco. 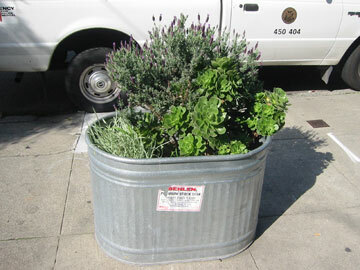 These containers could be made permanent by removing concrete and gardening directly in the ground. 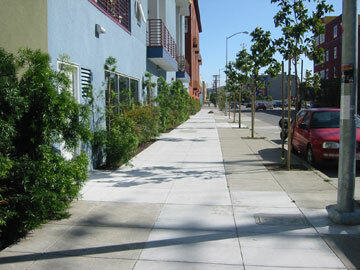 This sidewalk (below) was narrowed by just 12 inches to plant directly adjacent to the building, providing a living buffer between building and sidewalk which shades windows with western exposure. 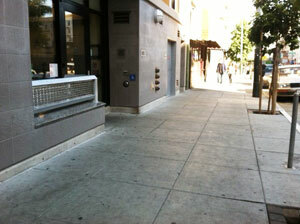 Even more of the sidewalk could be converted for this purpose. 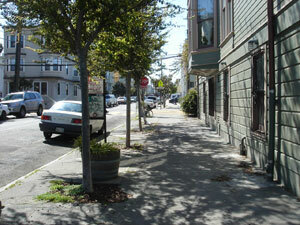 Likewise areas around street trees can be opened up considerably. 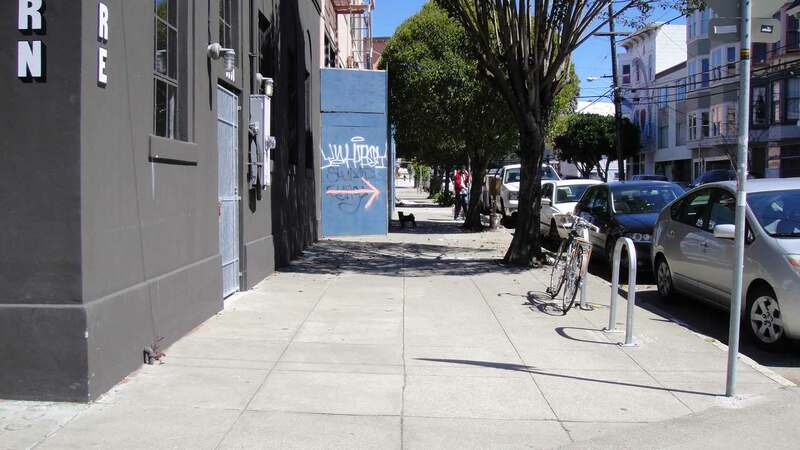 This triangular site is bordered by Harrison, Treat and 16th Streets and presents opportunities for permeable landscaping in the area now paved as street as well as the large triangular sidewalk area. It happens to be situated near a major underground knuckle of the sewer system. 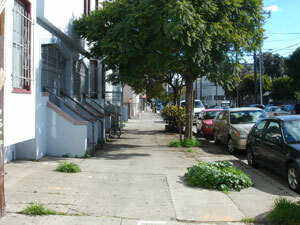 It would provide a neighborhood pocket park for the large number of new housing units directly across the street. 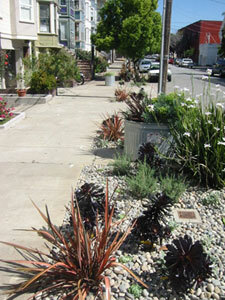 The excessive width of this 'halfstreet' between Valencia and Guerrero Streets provides an opportunity to dedicate generous planting strips. 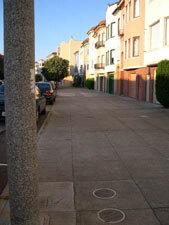 The character of this street would be totally transformed from its current un-natural state. 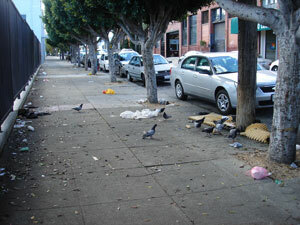 Many similar sites occur in other areas of The City. To propose a project, please contact Plant*SF.